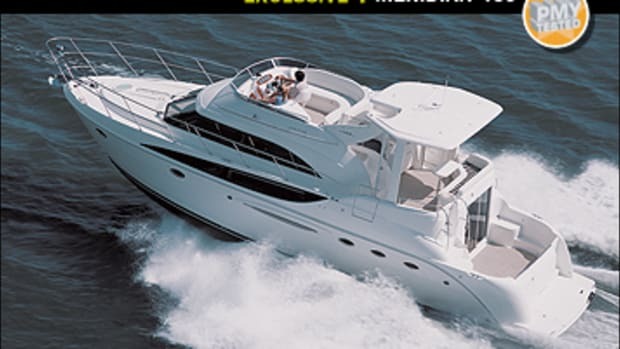 The Meridian 541 takes interior furnishings and layout to a uniquely residential level. What I saw at the top of the stairway pegged my practicality meter, but not in a good way. Over the years, I’ve come aboard any number of midrange cruisers with residential furniture in the saloon, much of it either unsecured to the underlying deck or secured in questionable ways. In the majority of cases, these attempts to add style and comfort to life afloat have served only to worry me, engendering as they do, visions of spring-loaded recliners bouncing off bulkheads as the winds pipe up or maybe even leaping overboard during an equinoctial gale. 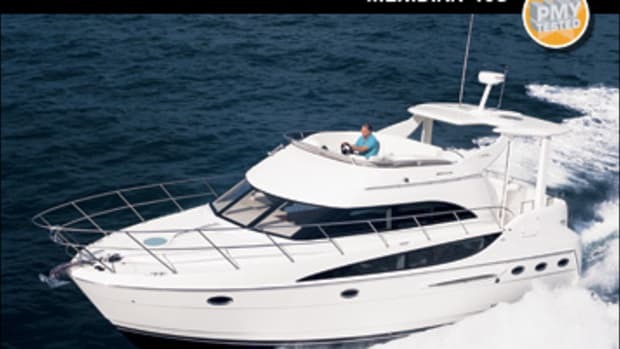 My first glance told me I might be looking at the same sort of lash-up in the saloon of the new Meridian Yachts 541 Sedan. The furnishings there—two sofas, two end tables, a chair, and an ottoman—looked about as residential and worrisome as any showroom offering you’ll find at Ethan Allen. Shapes were classically suburban, a styling statement much emphasized by Meridian’s standard usage of supple, top-stitched Brisa Distressed Ultraleather. And squat, stained American cherry legs undergirded just about everything, lending a living room familiarity to the scene. But, while these details generated plenty of visual appeal, the presence of what seemed like an entire suite of unsecured, residential furniture threatened a real ruckus, at least in my opinion, should something break lose in a seaway. Meridian’s director of marketing, Matt Guilford, must have noticed the look of concern on my face. “This stuff isn’t what you think, Bill,” he said while kneeling down near the forward sofa. Once I’d knelt down myself, I could see what he was pointing at—a beefy, virtually invisible molded-fiberglass part that constituted the actual structure of the piece. The sofa was not a residential stand-alone at all—it only looked that way, primarily thanks to its shape, the top-stitched Brisa, and the slick addition of the aforementioned legs, which were for looks only. “Amazing…really!” I commented, getting back up. In league with the saloon’s optional cherry-hued plank flooring, its encompassing windows and windshield panels (fabricated from the largest pieces of tempered safety glass you can buy in the United States, according to Guilford), and its cozy table lamps (securely anchored to the Karadon-topped molded-fiberglass end tables), my test vessel’s furnishings deceptively delivered all of the welcoming warmth of a waterfront home while simultaneously satisfying all possible seagoing concerns. Further revelations arrived shortly. Once I’d descended the stairway to the bottom deck (with its three-stateroom, two-head arrangement), I began noticing additional residential highlights almost immediately. 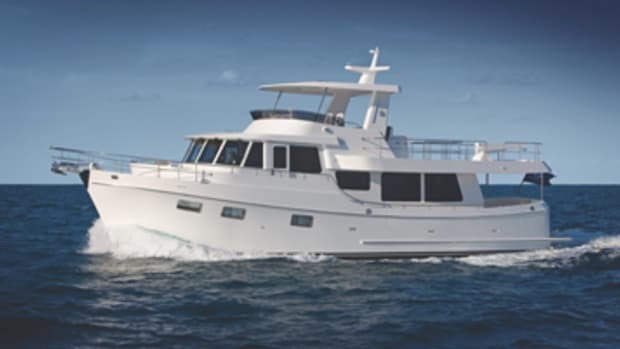 The full-beam master aft, for example, offered standing headroom of 6&apos;5", a real queen-size island berth (not modified to fit in the boat), a shore-side mattress, and true, right-up-to-the-headboard walkaround access. Moreover, there was an en suite head with an ample shower stall and real ceramic tile underfoot, opening ports in both swoopy side windows for cross ventilation, a full-featured entertainment center, and (instead of a short sofa) an optional built-in desk and chair. The forepeak VIP was similarly set up, offering walkaround access as well as a pillow-top innerspring mattress, plenty of ventilation (via a skylight as well as an opening hatch with OceanAir screens), and almost as many cedar-lined hanging lockers, drawers, and cabinets as the master. And the guest stateroom, just abaft the VIP and to starboard, promised an unusual level of comfort, with bunks that were each about three feet wide and therefore eminently snooze-worthy. One remaining aspect of the 541’s interior caught my eye as Guilford and I headed topside to crank the mains and take her for a test. 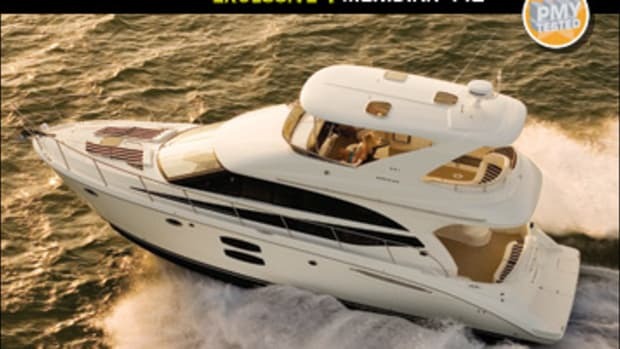 Because I’d entered the boat in a rush to confirm my suspicions concerning the saloon’s furniture, I’d breezed right past the galley and dinette area. 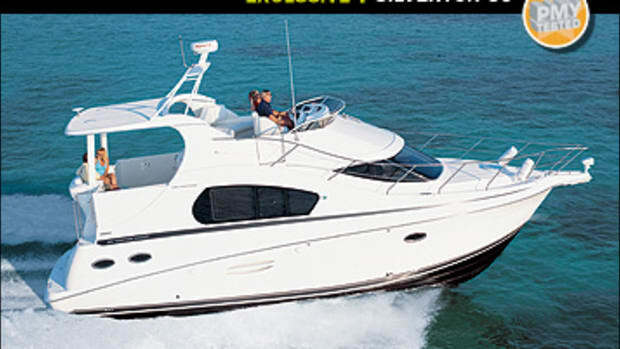 So on the flip-flop, I slowed down and took a more appreciative look at both the spacious booth-style convertible dinette on the starboard side and the full-featured L-shape galley to port. I found several especially engaging details here, including a Contoure microwave oven that’s also grill-capable, dual-tier windows that virtually blast in natural light, an aft window that lowers electro-hydraulically to create a pass-through into the cockpit, and a Karadon-topped bar and bar stools. 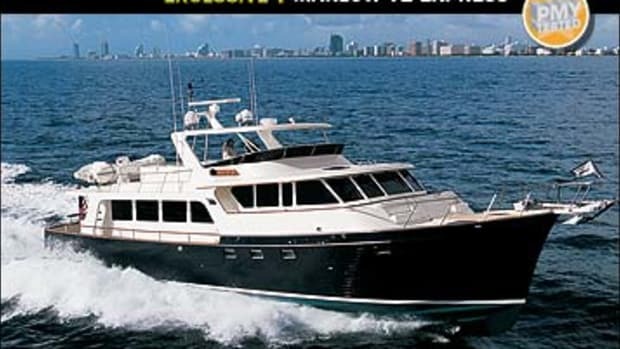 But I was especially struck with how Meridian so cleverly—and again, rather residentially—blends this vessel’s outdoorsy cockpit living with a comfy interior and strategically positions the galley at the heart of the mixture in the process. 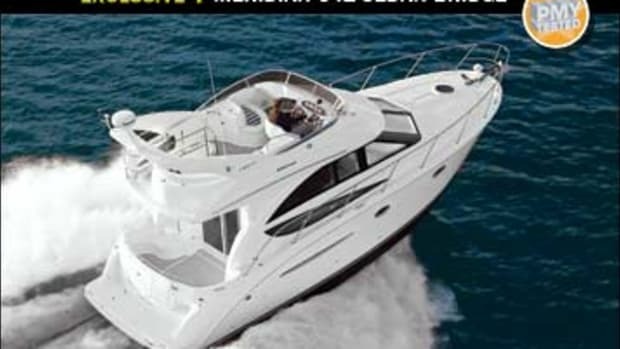 I thoroughly enjoyed easing the 541 away from her spot at the Miami Beach Marina via a superbly tweaked Cummins MerCruiser Zeus propulsion system. Seldom have I maneuvered a pod-type vessel that evinced such smooth responsiveness. Rotating the boat in front of her slip with the joystick, then cornering the fuel dock, and finally transiting the opening at the eastern end of the breakwater entailed absolutely no clutch clunk—I could neither hear nor feel any forward and reverse transitions as the pods did their thing. And I noted no maneuvering-related rocking motions either, despite the 541’s lofty 24-foot bridge clearance. Super-smooth, proportional hydraulics, not simple mechanics, actuate Zeus transmissions, and the result is palpable. Driving the 541 in the open Atlantic was almost as much fun as bopping around the marina. The average top speed I recorded was 34.6 mph, a rousing number considering the test boat’s full load of fuel, water, and gear for a projected trip to the Bahamas. The captain’s chair on the flying bridge was comfortable. My test boat’s turning radius, well under three boat lengths by my estimation, was impressive. And, with the Zeus integrated tabs automatically handling trim, the running attitudes I measured were optimal (see “By the Numbers,” this story), an attribute that produced excellent and unlimited visibility over the bow, even coming out of the hole. Predictably perhaps, offshore performance was not what I was thinking about as I drove Meridian’s 541 Sedan back to the marina though. 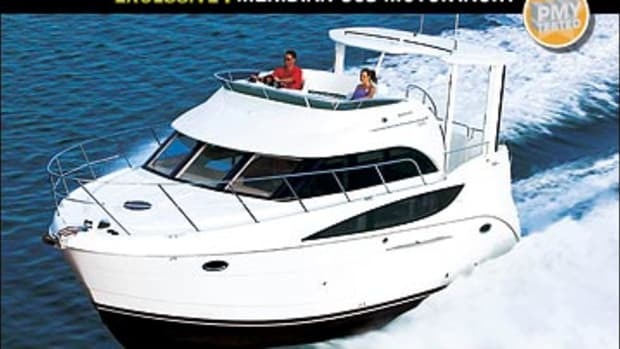 Certainly, the big stylish cruiser was fast and fun to drive on the high seas and her dockside maneuverability was unmatched in terms of ease and smoothness. But my mind kept returning to those furnishings in the saloon: the pillow-top mattresses in the staterooms and the strategically positioned galley, complete with cockpit bar. 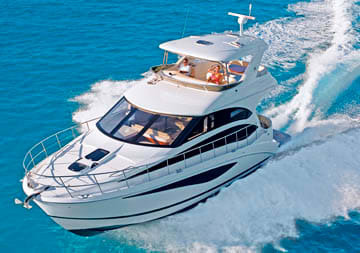 This article originally appeared in the June 2010 issue of Power & Motoryacht magazine.